Born in Chicago and former neighbor to Al Capone, Bianca was born Blanche, but changed her name to Bianca during her international Flamenco dance career. After 20 years of Flamenco, she became a costume seamstress. After she was diagnosed with dementia in 2008, she moved into a retirement home. Losing her apartment and her memory, Bianca wanted to commit suicide. Her daughter did not want a relationship with her; she has no other living relatives. More than anything, she’d express that losing her independence was her greatest point of despair. “It’s a prison,” she’d shares, as I took notes. She’d say, “Write down it is a prison,” in reference to the retirement home where the large gate not only kept people out, but also kept individual in. Her favorite thing to do is eat shrimp, drink champagne and dance, even when she has experienced a sense of alienation and depression related to dementia. I have spent hours on her white couch, having long discussions about feelings while listening to Billie Holiday on tape. When I was 14, Bianca approached me at a coffee shop and asked me what I wanted to do with my life. I told her it was documentary photography. She responded, "oh good. You will never be lonely." I have been photographing Bianca since then. Bianca's favorite song is Blue Moon. “Blue Moons of Bianca” is a 10 year photo, video, writing and sound based documentation. It is not only a document of her life, but also a conversation between us about remoteness, imprisonment, and feminized anxieties. 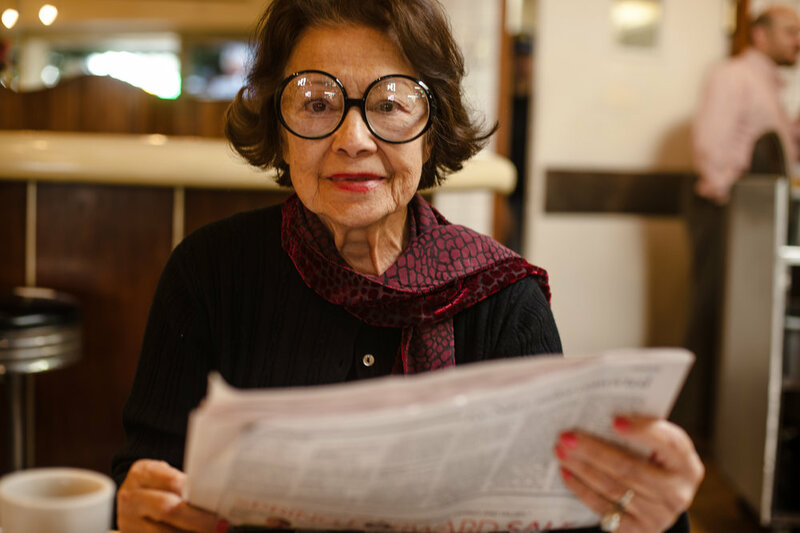 Bianca, age 82, sits in the cafe she visits daily in Los Angeles, 2008. Bianca, age 83, holds her face in reaction to learning that she has been moved to a retirement home because she was diagnosed with dementia, 2008. Bianca, age 84, turns on the light in her apartment at the retirement home at night, 2009. Bianca, age 85, sits in the dentist’s chair, 2010. Bianca, age 87, sits in her apartment after going on a disappointing date with Bill, another resident, who spent most of the time talking about himself rather than asking Bianca questions, 2012. 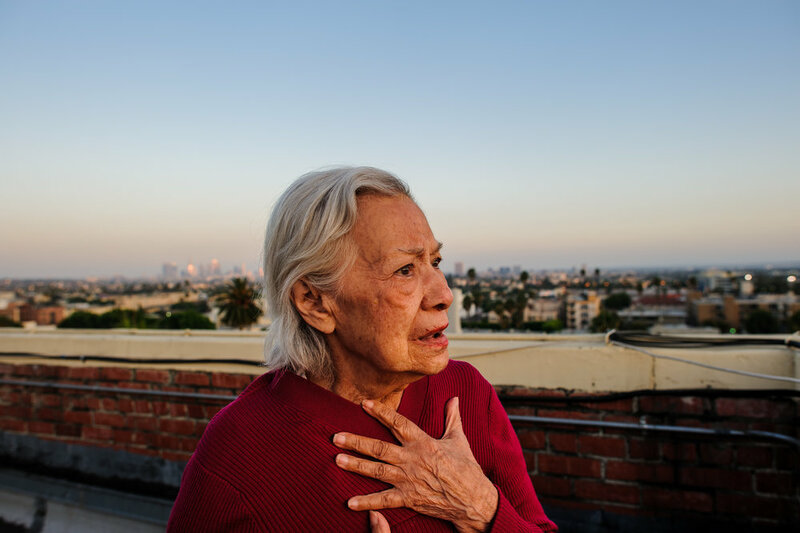 Bianca, age 85, stands on the roof of the retirement building where she lives in Los Angeles, 2010. Bianca, age 85, walks passed words she wrote on her wall in lipstick, 2010. Bianca, age 85, stands in an empty apartment after deciding to switch apartments due to vertigo, 2010. Bianca, age 85, stands in her apartment in Los Angeles, 2010. Bianca, age 86, stands in her apartment at night, 2011. Bianca, age 86, sits with Bill during dinner hour at the retirement home, 2011. Bianca, age 85, stands in the elevator, 2010. Bianca, age 85, looks for clothing in her closet, 2010. Bianca, age 87, blows out her candles, 2012. Bianca, age 87, lies on her bed, 2012. The window across from Bianca’s apartment, 2012. Bianca, age 85, wears her signature glasses and nightgown in front of her mirror, 2010. Bianca, age 85, sits on her couch, 2010. Bianca, age 85, showers, 2010. Bianca, age 86, stands her apartment at night, looking at the front door in fear that someone will come in, 2011. Bianca, age 88, lies on a bed in the emergency room after a fall, 2013. Bianca, age 88, sits in her room in a locked memory care ward after her prior retirement home administrator decided to move her elsewhere, 2013. Bianca, age 85, stands by her window in the afternoon, 2010. Bianca, age 87, in bed, 2012. Bianca, age 93, on her birthday, 2018.